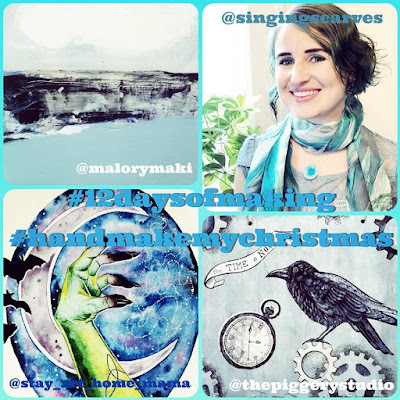 Original Sin Art: 12 Days Of Making, Day Seven. 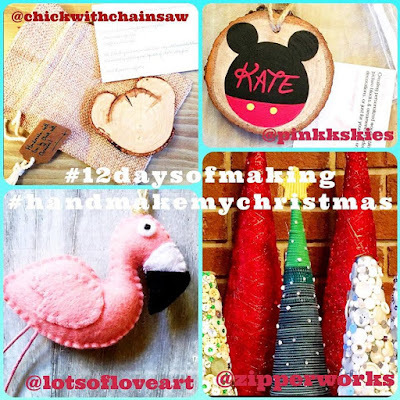 The prompt for Day Seven of our 12 Days Of Making Challenge was CHRISTMAS SHOPPING! We were wondering, who is on your list, and whom are you looking to buy from? Well, I don’t want to give anything away and spoil any surprises, so I thought I would share with you all some of the fabulous artists that I have bought from in the past. Maybe you’ll spot something that will inspire you to buy from them this holiday! After all, this whole challenge is about hand making, and supporting small shops. I have added links to the artist's names where I could. This first collage is all about crafty crafters! Top left, you can see a beautiful wooden wishing heart made by Louise from Chick With Chainsaw. Top right is a gorgeous Mickey Mouse wooden decoration by Caren over at Pinkk Skies. Bottom left is a fabulous felt flamingo ornament by Mazena of Lots Of Love Art. And that green tree in the middle of the last pic is made from upcycled zippers by the talented Janet at Zipperworks! If you are on the lookout for some beautiful and unique jewelry, I have four makers right here to give you some ideas! Top left is a gorgeous crocheted necklace and Czech glass earrings from the lovely Misty Dubois. They were a Christmas gift to myself last year! 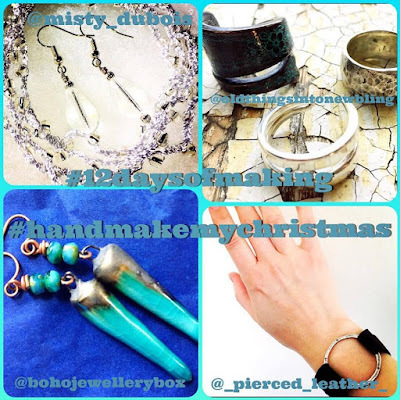 Top right are three fabulous upcycled rings made by Jim from Old Things Into New Bling. The two on the left are made from old silverware, while the one on the right is made from silver scraps from the silverware, so nothing goes to waste! Bottom right is a beautiful leather and hammered metal bracelet by the magnificent Karen from Pierced Leather. This was a birthday gift to myself this year. She also makes incredible earrings! Bottom left is a commission that I asked for from the beautiful Clare of Boho Jewellery Box, who also happens to be the brains behind this whole challenge! I asked her for some teal earrings for my birthday, and she came up with these beauties. And last, but not least, here are a few painters for you to peruse. All with very different styles! Top left is a gorgeous painting from Deb, the creative genius behind Malory Maki. She has her own incredible abstract style that always evokes the most intense emotions in me. This piece reminded me of the seashore on a stormy day, and I can’t get enough of looking at it! Top right is a beautiful silk scarf from the talented Maria of Singing Scarves, which was another special commission for me. I asked Maria to use the colours teal and grey, and add some dragonflies, and my favourite motto, “Get Up, Dress Up, Show Up, and Never Give Up”, so now I have a motivational scarf that is just perfect for me! Bottom right is a hand painted slate from the lovely Debbie of The Piggery Studio. I saw this steampunk raven and just HAD to have it, since it combines two of my great loves. If you ask nicely, she does commissions too, so you should definitely check out her shop for a unique gift this Christmas! At bottom left you can see my gorgeous Witches Hand painting by Jess of Stay Art Home Mama. I just love Jess’s style, and of course, this will be hanging in my house all year round, not just at Halloween! Jess is also one of our makers in this challenge, and you will have the chance to win an exclusive gift from her, as well as all the other artists involved, so make sure you follow the prompts and play along!